It is the time of year when the Pied-Imperial Pigeons return from their wintering grounds in the lowlands of New Guinea to breed in Australia. Previously known as the Torres Strait Pigeon, these are a large white or pale cream bird, with black on the flight and tail feathers and with black spots under the tail. They feed on the fruit of trees, palms and vines, and are frequently seen foraging in suburban gardens. Fruit is eaten whole with the seed either excreted or regurgitated after the pulp is removed. As such they are important dispersers of rainforest seeds. Pied-Imperial Pigeons are found across the top of Australia and down the east coast to around Rockhampton. In north-east Queensland, they breed primarily on off-shore islands, such as the Brook Islands, in colonies that may number tens of thousands of birds. 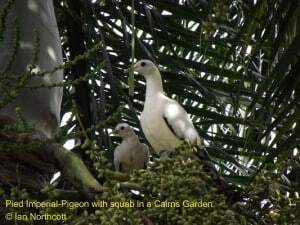 Some breeding also occurs on the mainland, generally as isolated pairs, and increasingly we see Pied-Imperial Pigeons choosing to nest in suburban yards. Nests are a rough stick platform, usually in mangroves but also in forest trees, palm fronds, vines or a myriad of other locations. The female lays a single white egg and up to three clutches may be laid during each breeding season. Parents alternate incubation, taking turns to spend a day foraging in the mainland rainforest. The daily flights of flocks between islands and the mainland are one of the amazing sights of far north Queensland. Pied-Imperial Pigeons were the first Australian bird to be recorded by Europeans, when Luis Vaez de Torrens noted their presence on islands of the Torres Straits in 1606. At that time, the pigeons were present in immense numbers that stretched down to south-east Queensland. With European settlement, the Pied-Imperial Pigeon’s prospects began a serious decline. In Queensland, clearing and development of rainforest foraging sites took its toll, and hunting pressures were intense. By 1877, population declines brought in the first hunting restrictions, but these were generally ignored. The south-east Queensland population was decimated. Mainland nesting birds were particularly vulnerable and soon the population was essentially restricted to island breeding birds. Pigeon hunting expeditions to Queensland were advertised in the NSW newspapers. Birds were shot on their island nests through the day, and flocks would be ambushed as they returned to their colonies in the afternoon. Additional legal protections were put in place, but the birds continued to be commonly hunted into the 1960s. Public opinion turned against pigeon hunting when poachers killed 1100 Pied-Imperial Pigeons at a breeding colony near Cardwell. Courageous conservationists Arthur and Margaret Thorborne rallied for their protection and established monitoring programs. Monitoring continues to this day as a project supported by BirdLife Northern Queensland. Recovery has occurred since that time, albeit slowly. Monitoring showed that it took twenty years for the colony near Cardwell to recover from the killing of the 1100 birds. Numbers will not return to their pre-European levels as the loss of vast tracts of rainforest to agriculture and development has reduced the population that can be supported. In addition, hunting and habitat loss in their PNG wintering grounds remains an issue. Still, the outlook for the Pied-Imperial Pigeon has improved. In Queensland there are over 150 island breeding colonies of varying sizes and an increasing amount of mainland breeding. The total Australian population is now estimated as 500,000. Still, we should not be complacent, as the continued protection of foraging and breeding habitat remains essential for the future of this wonderful bird.